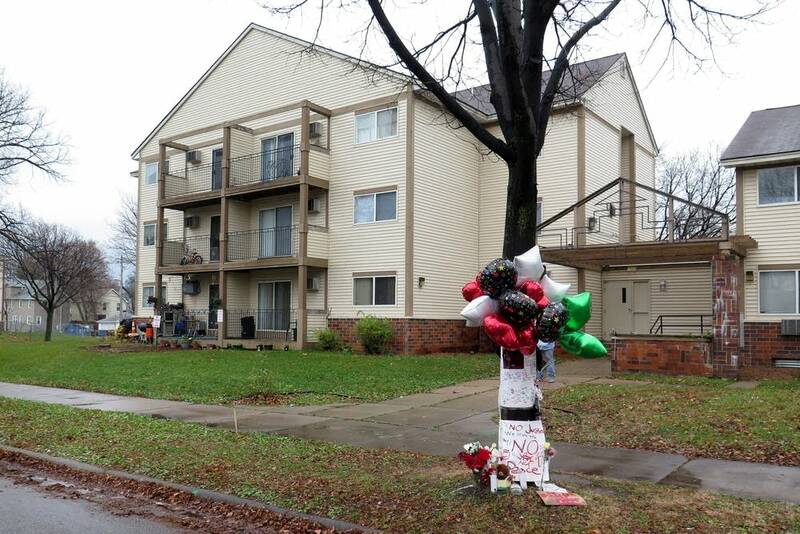 Minneapolis police shot 24-year-old Jamar Clark nearly three weeks ago. Clark, a black man, died the next day. The shooting has become another flash point in a national discussion over police use of force against black citizens. But the circumstances around Clark's death remain unclear — and contentious. The moment that prompted weeks of anguish began as a celebration. Nekelia Sharp was about to turn 39. She'd invited friends over to her Plymouth Avenue apartment Saturday night, Nov. 14. 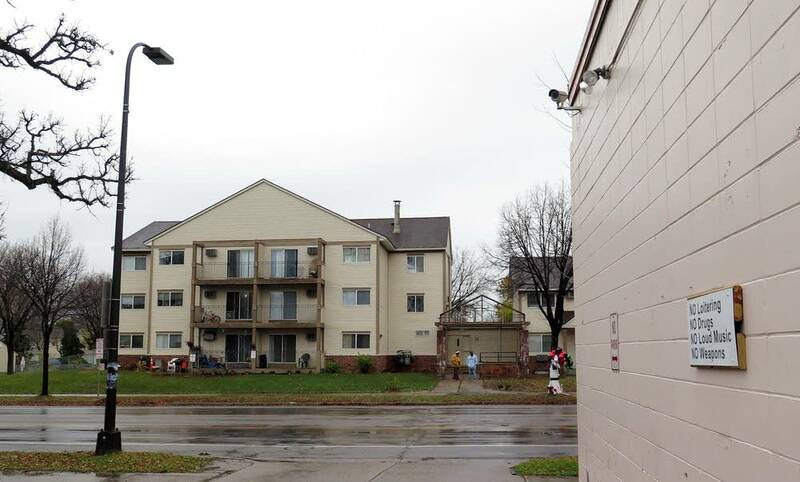 Jamar Clark and his girlfriend — who has never been identified publicly — were there for the party. But trouble started early Sunday morning when Sharp said she and her husband got into a fight and Clark's girlfriend got involved. "We were having our little dispute, or whatever," Sharp said. "The girlfriend grabbed me. Actually, I was trying to fight with her, you know, tell her, 'Don't grab me.' When someone is fighting you don't grab nobody." "He was grabbing her, telling her to let me go, that had nothing to do with her, that's not her business," Sharp said. "And actually what the girl did was she hit him." Sharp said Clark and his girlfriend left — no one has said where they went or what happened while they were gone — and a short time later, someone called for help. Sharp was outside when the paramedics arrived. She let them into the building and watched as they brought out Clark's girlfriend and put her in an ambulance. Sharp said Clark's face was swollen, as though he'd been hit. From a porch across the street: "We saw the man get shot." 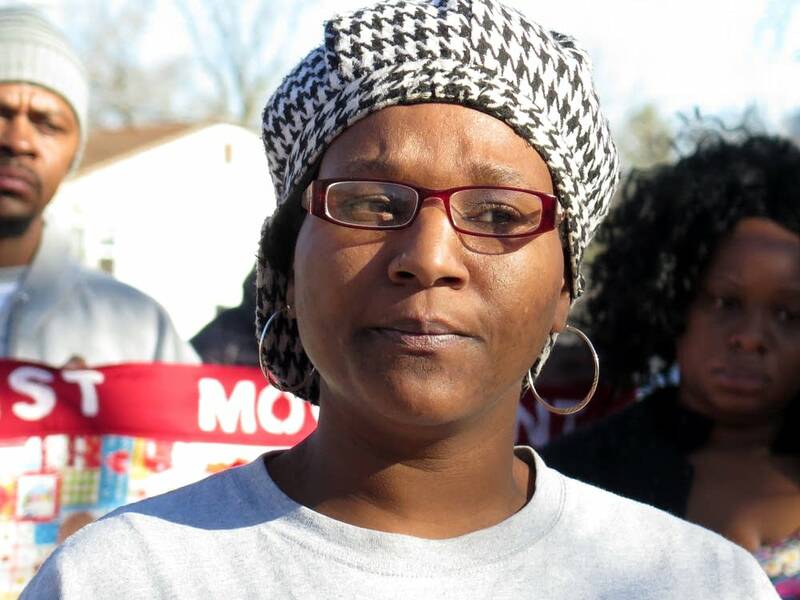 Kiesha Steele was on a porch about 50 feet away, watching as Clark approached the ambulance. "As he was looking in the ambulance, [the] EMS commander pulled up [and] told him to step back. So did the Minneapolis police," she said. 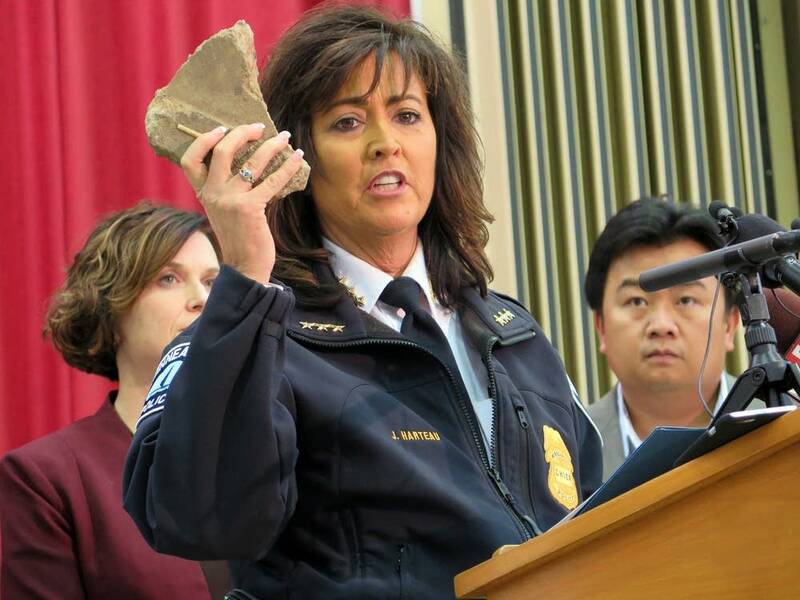 "When the Minneapolis police got out of the car, they each took an arm. They arrested him, put him on the ground. The EMS commander put his knee on [his] chest. ... And as soon as as he put his knee on his chest all you hear was the gunshot. "We saw the man get shot. Smoke came out of him. Blood came up." It was a little before 1 a.m. on Nov. 15. Clark was taken to the hospital with a gunshot wound to his head and put on life support for about 40 more hours. But his life esentially ended on the side of Plymouth Avenue that morning. And that's where the questions begin. Officials: "During the struggle, an officer discharged a weapon"
Here's the official version, from Minneapolis police chief Janee Harteau. "This morning at 12:45, officers in the 4th Precinct were called to an assault call, which was quickly changed to a help call, as a suspect involved in the assault confronted paramedics. "When officers arrived, there was a confrontation and struggle. Preliminary information shows that the man was not in handcuffs. During the struggle, an officer discharged a weapon." Harteau put two officers — Dustin Schwarze and Mark Ringgenberg — on leave. Both are veteran police officers who have been on the Minneapolis force a little more than a year. Authorities have not said who actually pulled the trigger. Neither officer has spoken publicly about the shooting. But a few days after the incident, Minneapolis police union president Bob Kroll filled in some details that he said came from an attorney representing the officers. "When police arrived, Mr. Clark refused to show his hands or otherwise comply with police orders," Kroll said. "While being legally detained, he chose to resist, fight officers and seize control of an officer's firearm. "Mr. Clark was given multiple opportunities to desist. Instead, he chose to engage officers in a life or death struggle for an officer's weapon." Kroll said that, at some point, Clark had physical control of the hand grip of the officer's gun while it was in its holster. But Kroll's third-hand description of a defiant and potentially armed Jamar Clark differs fundamentally from that of several people who say they saw what happened. Conflicting descriptions: "There was not a struggle and no question was asked." Hours after the shooting, as the first protesters started to gather, Teto Wilson said he saw the shooting from a social club across Plymouth Avenue. "Me and some friends we were leaving out of the Elks last night," he said. "And when we got outside, we saw the cops. "They had the guy pinned down on the ground. This guy wasn't fighting. He wasn't kicking. He was perfectly still, laying on the ground." From her nearby porch, Keisha Steele said she saw Clark's hands behind his back when the shooting took place. 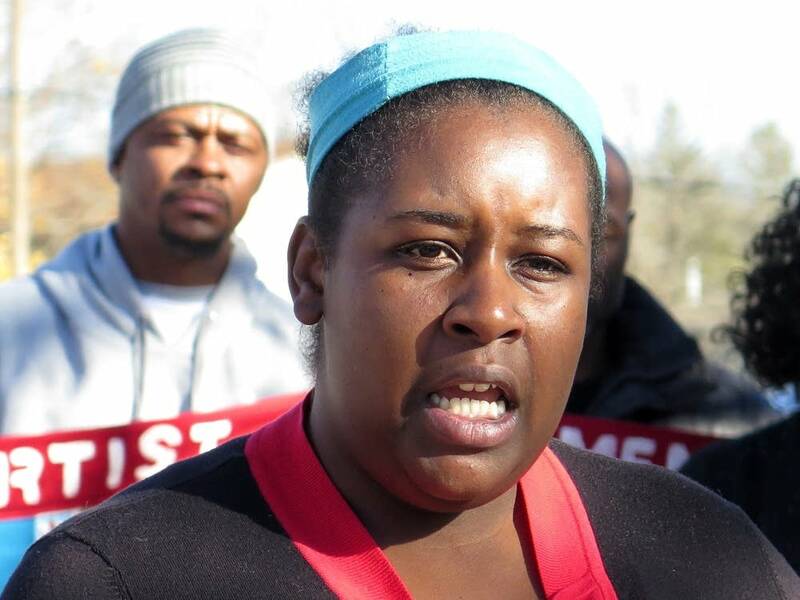 Nekelia Sharp — host of the party where it all started — said she also saw a subdued Jamar Clark. "This young man was in handcuffs," she said. "He did not resist. There was not a struggle and no question was asked." Very little new information has come forward in the last few weeks that would resolve the wide discrepancies between the official accounts and those of eyewitnesses. One video, purportedly taken after the shooting, shows a motionless form on the ground. Some social media commentators believe they see handcuffs near the body, but the video is too dark and taken from too far away to make out much of anything. State authorities said there were handcuffs at the scene, but they are still investigating whether they were used on Clark. Those investigators also said they have video footage of the incident from several sources, none of which shows what happened in its entirety. Gov. Mark Dayton watched footage taken from a camera on the back of the ambulance and declared it inconclusive. "There's just a very brief fragment where Mr. Clark and one of the officers are encountering each other, and then they disappear from sight, and there's no other view of them until one of the officers, after the shot was fired, one of the officers comes back into the camera view," the governor said. 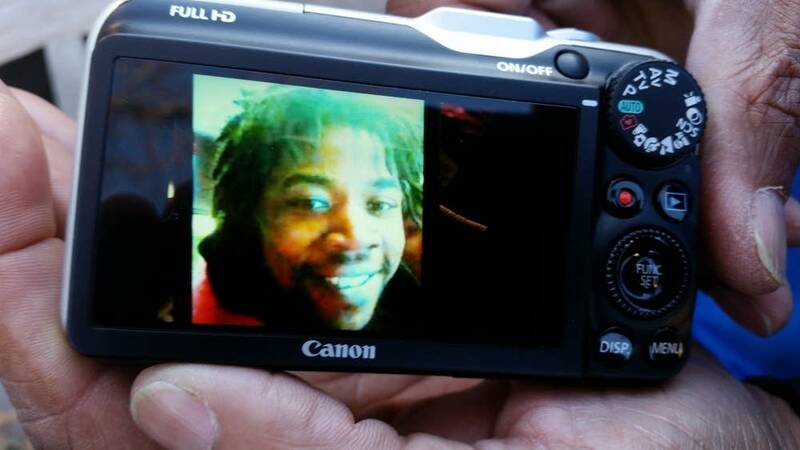 That ambiguity suggests that even if protesters get the last of their initial demands — that authorities release of all video footage from around the time of Jamar Clark's shooting — what happened that morning along the side of Plymouth Avenue might always be in question.